Soft silken Tofu MORI-NU: In this food there are some nutrients that are found in low quantity, for example carbohydrate, total dietary fiber and total sugars. Firm silken Tofu MORI-NU: In food has a low quantity of carbohydrate, total dietary fiber and total sugars. Cooked tempeh: This food is low in total dietary fiber, total sugars and sodium but Cooked tempeh has copper in high quantity. Soymilk SILK Plain: Soymilk SILK Plain is low in food energy, total lipid and carbohydrate. Soymilk SILK Vanilla: In this food there are some nutrients that are found in low quantity, for example food energy, total lipid and carbohydrate. Soymilk SILK Chocolate: In food has a low quantity of protein, total lipid and total dietary fiber. Soymilk SILK Light Plain: Soymilk SILK Light Plain is low in food energy, total lipid and carbohydrate. Soymilk SILK Plus Fiber: In food has a low quantity of food energy, total lipid and iron. Soymilk SILK Unsweetened: Soymilk SILK Unsweetened is low in food energy, total lipid and carbohydrate. Soymilk SILK Very Vanilla: In this food there are some nutrients that are found in low quantity, for example total lipid, total dietary fiber and iron. 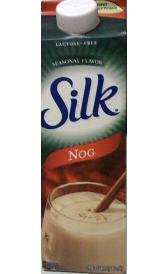 Soymilk SILK Nog: In food has a low quantity of total lipid, total dietary fiber and calcium. Soymilk SILK Chai: Soymilk SILK Chai is low in total lipid, total dietary fiber and iron. Soymilk SILK Mocha: In this food there are some nutrients that are found in low quantity, for example protein, total lipid and total dietary fiber. Soymilk SILK Coffee: In food has a low quantity of protein, total lipid and total dietary fiber. SILK Plain soy yogurt: In food has a low quantity of total lipid, total dietary fiber and iron. SILK Raspberry soy yogurt: In this food there are some nutrients that are found in low quantity, for example total lipid, total dietary fiber and magnesium. SILK Peach soy Yogurt: In food has a low quantity of total lipid, total dietary fiber and magnesium. SILK Blueberry soy Yogurt: In this food there are some nutrients that are found in low quantity, for example total lipid, total dietary fiber and magnesium. SILK Key Lime soy Yogurt: In food has a low quantity of total lipid, total dietary fiber and magnesium. SILK Original Creamer: In this food there are some nutrients that are found in low quantity, for example protein, ash and total dietary fiber. 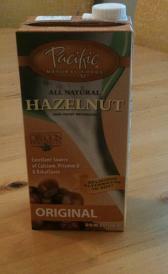 SILK Hazelnut Creamer: This food is low in protein, ash and total dietary fiber but SILK Hazelnut Creamer has total sugars and vitamin c in high quantity. Garden Vegan GARDENBURGER: In food has a low quantity of total lipid, total sugars and magnesium. Original GARDENBURGER: In food has a low quantity of total sugars, magnesium and selenium. Bean beverage: Bean beverage is low in food energy, total lipid and total dietary fiber. Papad: High in protein, ash and carbohydrate and low in water, total sugars and vitamin c.
Made from soy vermicelli: This food is low in protein, total lipid and magnesium but Made from soy vermicelli has ash, carbohydrate and zinc in high quantity. Meatless chicken: High in protein, phosphorus and sodium and low in carbohydrate, total sugars and potassium. 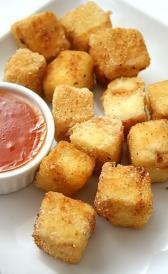 Meatless fish sticks: Meatless fish sticks is high protein, ash and phosphorus. On the other hand. is low in total sugars, manganese and vitamin c.
Meatless frankfurter: This food is low in total sugars, manganese and vitamin c but Meatless frankfurter has protein, phosphorus and copper in high quantity. Meatless luncheon slices: This food has a low quantiti of carbohydrate, total dietary fiber and manganese but has a high quantity of phosphorus, sodium and copper.